Tashi and Jack go on a trip to 'sauce' the ingredients to whip up a batch of ketchup. Sauce mania soon takes over the village, even attracting the attention of a ketchup crazed giant to the town. Uh oh! 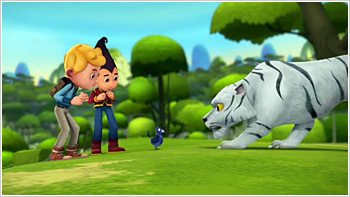 Notes: Tashi first aired on 7Two starting in November of 2014. This guide is based on the numerical order established on the ABC's site for the series which does not match the order the episodes aired on either 7Two or ABC3. 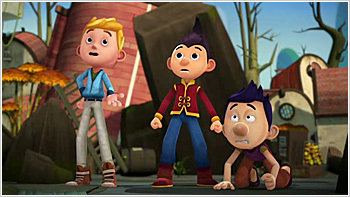 When Jack accidentally sells a not-so-magical Wishing Tree to a giant, Tashi and Jack need to get it back before the Giant realises he's been tricked! 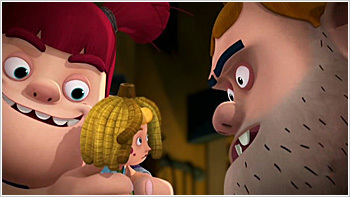 Jack disguises himself as the dolly Little Giant has wished for. 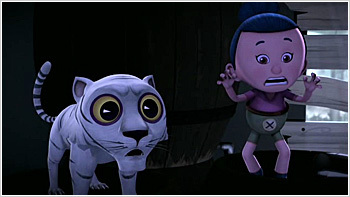 When playing with their kites admist a wild thunderstorm, Tashi and Jack watch as Granny White Eyes is whipped up by the wind and sent flying off into the forest. Stuck up in a tree, Tashi borrows a ladder to rescue her. 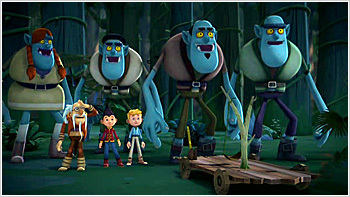 After accident-prone Jack is crowned the Village Warrior, his first job is to protect the village from a rowdy bunch of Ogres that have settled nearby. Tashi challenges Azgrog to a series of games. On the night of the Golden Jawbone storytelling competition, Tashi is experiencing brain fizz. When the greedy Baron chases after Tashi for a winning story, they are forced into a wild adventure with witches, bandits, tigers and the pigeon who started it all. When Tashi and Jack find Wise-as-an-Owl in a deep slumber and are unable to wake him, they find Baba Yaga and ask her for the cure for Creeping Sloth Sickness. She sends them to Demon's Peak to retrieve a fire herb. 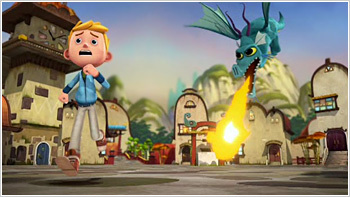 Lotus Blossom manages to calm a rampaging dragon long enough to determine a rotten tooth is the cause behind the dragon's rage. 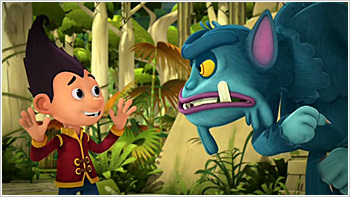 Tashi and Jack sneak into the giant's house to borrow some ground dragon's tooth to fill the gap. 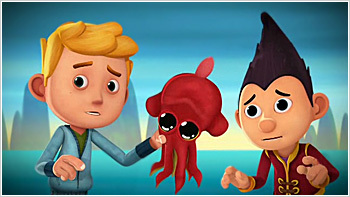 When Jack reels up a baby kraken, Squidly, in a fishing competition, he and Tashi adopt it as a pet. 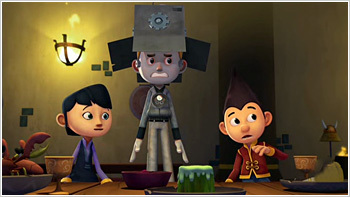 Meanwhile, a series of thefts occur in the village and agent Jack is on the case. When groaches invade, the only way to get rid of them is the stink from a Stonk! While the boys are on the search for the stinky Stonk, they stumble across Lotus Blossom, who has been hexed by Baba Yaga and is half fawn! 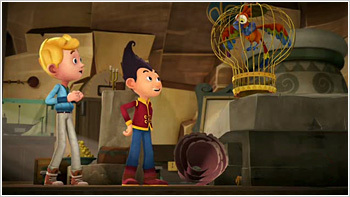 Inside Tiki Pu's shop, a squawking parrot tells Tashi and Jack of hidden treasure, and when they accidentally set it free, Tiki Pu orders them to bring it back, or else! On Fungus Day, the day of an annual hunt for mushrooms and lichen, Tashi and Jack are high above the mountain peaks on a glider being chased by an angry giant Shiitake bat. 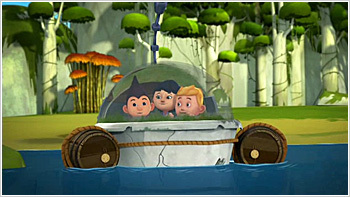 Just as they manage to crash land into the forest, they stumble across some bandits. To keep the bandits from plundering the village, Tashi and Jack lead them up to Drongo Peak in search of the infinite riches to be found there. 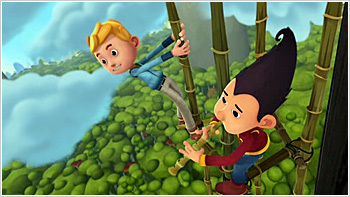 Upon giving chase to a theiving band of papaya monkeys, Jack is kissed by the Monkey Princess and begins to turn into a monkey! 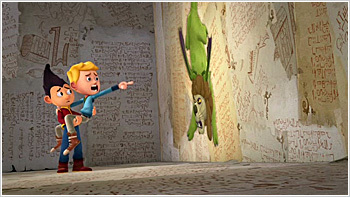 The only way to turn him back is to infiltrate the Monkey Temple and have Jack kiss the Monkey Princess. When Tashi's mussel soup concoction accidentally shrinks the Warlord instead of making him super strong, a pesky Kingfisher swoops in and flies the Warlord back to its nest. 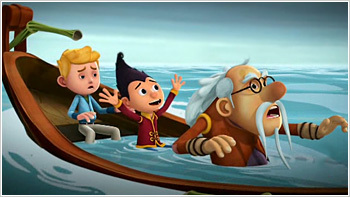 An enraged Mumsy sends Tashi and Jack to go rescue her son. At the Baron's circus, Lotus Blossom discovers the brand new act is a very unhappy dragon who has had the fire in his belly stolen by the Baron. 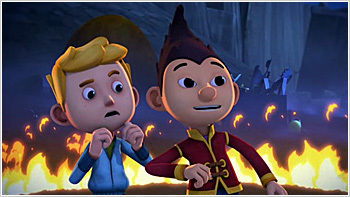 Tashi, Jack and Lotus become part of the act to replenish his flames. 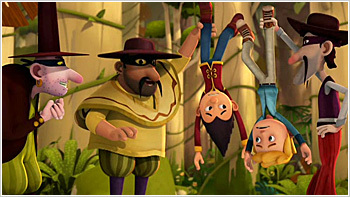 When Jack and Tashi stumble into a bandit camp, they are recruited by the chief to join their bandit gang. 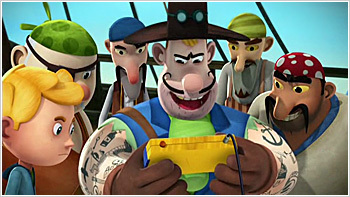 Though the boys do their best to be the worst recruits ever in hopes of being thrown out, the bandits are thoroughly entertained by their antics. 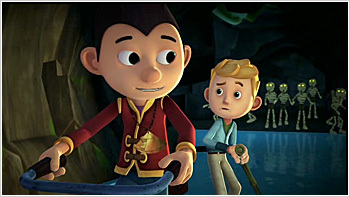 As the boys prepare for the annual floating lantern festival, their lantern goes rogue and leads them on a chase up into the Misty Mountains inhabited by the Yugala. 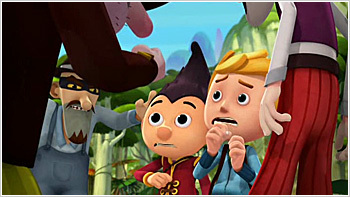 There the boys run into Second Uncle, who has been trapped on the mountain. Every year on her birthday, Baba Yaga likes to torment the town. This year, she's created a miniature model of the village that replicates any mischief she wreaks, upon the real village. When the Baron unlawfully comes to auction off Granny's house, Tashi, Jack and Lotus Blossom head off to raid the Baron's vault to gather enough jewels to buy back the house. 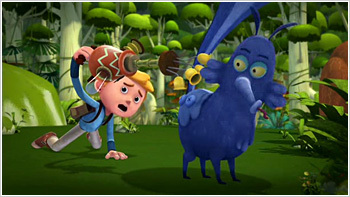 In order to win the harvesting competition, Jack and Tashi set off to retrieve some Rumpus milk. 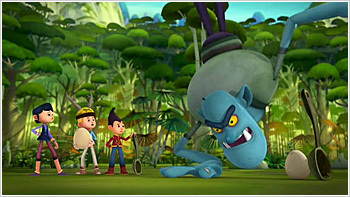 When Jack gets separated from Tashi, who is being chased by a Rumpus, he is tricked into trading the milk for some magic beans. 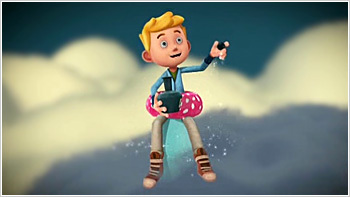 When some mischievous Airmaids feeding on rainclouds are discovered to be the cause of the village drought, Tashi, Jack and Lotus must fly up to the clouds to replenish the cloud's water supply with storm sprinkles. When the perfect day comes along for the Phoenix to migrate away from the village to the Mountains of Molten Fire, the villagers gather to participate in a race to retrieve a single phoenix feather that will keep the village fires lit throughout the winter. 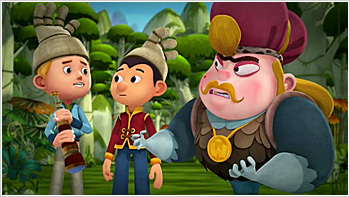 When Jack and Tashi are sucked into Wise-as-an-Owl's mischievous Book of Tales, they are chased by the Mixed Up Monster. They encounter a Knight who is ready for a fight, but has lost his sword and shield. 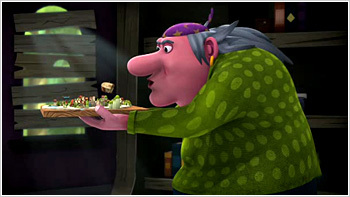 Tiki Pu's ice block stall is an absolute sell out on a hot summer's day, so when Jack and Tashi's super hot curry accidentally melts all of Tiki's products, he sends them packing to the mountains to bring back some more ice. Inside the frozen cavern of Do-Not-Ever-Go-There, they unknowingly release an ice imp who must be recaptured lest she freeze everything in the land. When the Midnight Sloth is stolen from the village, Tashi and Jack must get it back from a fearsome Demon trio, otherwise no one will be getting a good night's sleep anytime soon! 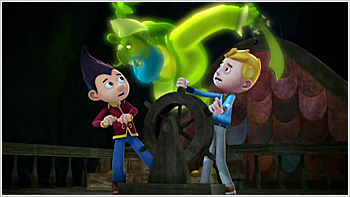 When Jack's game console is taken by the Baron in payment to some plundering Sky Pirates, his attempt to get it back results in him stowing away on the pirate ship. It's time for Tashi to get back the village's belongings! 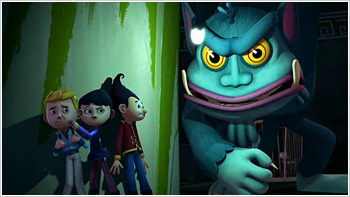 Tashi: Attack Of The Mumblies! 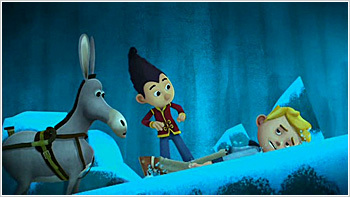 When Tashi and Jack discover an ancient amulet in a tomb, they awaken the sleeping mumblies within and are chased back to the village. 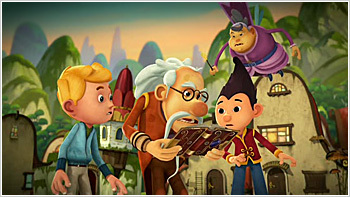 The amulet is stolen by the Baron to control the mumblies and power the village with electricity. When the Warlord's mother opens a baby rumpi petting zoo, the only thing missing is the actual Rumpi! When she catches wind of the mythical Great White Rumpus, Sir Buttalot, Tashi and Jack are sent on a dangerous journey with the Warlord to find it. Fed up with the obnoxious new town crier, Tiki Pu, the boys decide to start their own printing press and deliver news peacefully to the village. Unfortunately, Tiki is always one step ahead when it comes to finding a scoop. When a diamond comes hurtling through the atmosphere and lands in the ocean, not far from the village, the race is on to retrieve it! 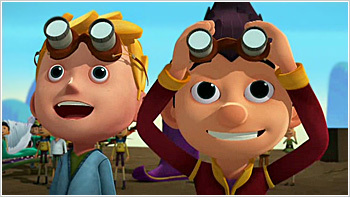 Tashi and Jack are up against the likes of the Baron, stormy seas and the Kraken. When Jack stumbles across an old stone tablet in Toad Forest, one-armed Borg the Invincible and his unbeatable army of ghost pirates are set free. Their first order of business is to plunder the village. 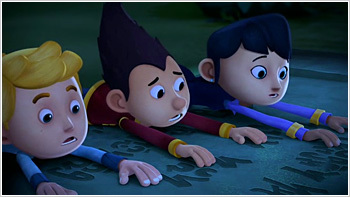 Can Tashi, Jack and Lotus send them back to their tomb? It's Sprite Night in Tashi's village and all the villagers are in costumes. When an encounter with Lily Thistle ends in a double dare, Tashi, Jack, Lotus, Ah Chu and Lily find themselves on an adventure to seek out the evil demon Old Ratmus... Don't say his name! 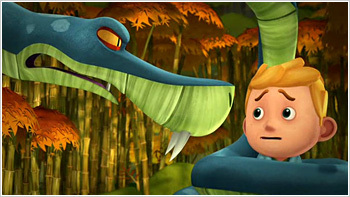 Upon exploring the bamboo forest with Tashi and Jack, Lotus Blossom gets bitten by a bamboo snake and begins to turn into a bamboo plant. 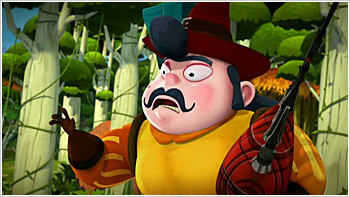 The timing couldn't be any worse as the Baron's latest scheme is to harvest the entire forest! 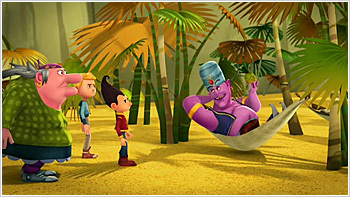 Tashi and Jack have been invited to CanDu's birthday party and acquire an old rug from Second Uncle. 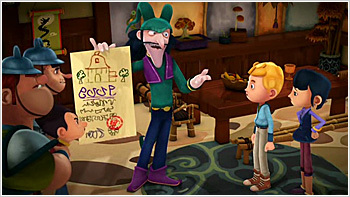 Just as CanDu becomes skeptical of the 'magic' carpet, the inscribed runes send them into the future where they encounter the fabled monkeys of Moochananar! 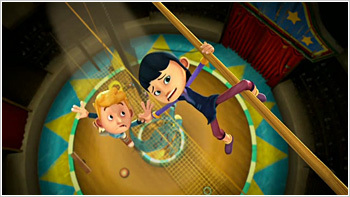 Tashi tells Jack about the annual dancing competition, but the trouble is that Jack can't dance. 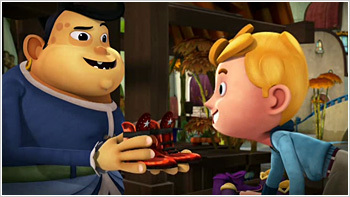 When Tashi and Jack stumble upon a shoe stall at the market, Jack trades his old stinky sneakers for some dancing shoes. The shoes immediately help Jack to dance, the only problem is that they never stop! 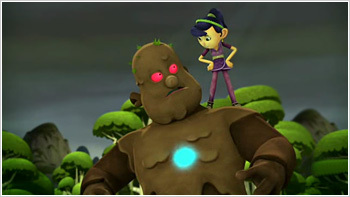 After a series of failed attempts to build a secret log fort, Tashi, Jack, Lotus and Ah Chu decide the only way to stop Lily Thistle's goons from smashing down their fort is to build their own Golem. 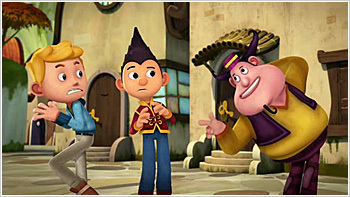 The hunt for a pie thief leads Tashi, Jack and Ah Chu to a haunted house in the forest — the lost Mansion of Spirits, said to be haunted by old Captain Stumpshank himself. The thief is revealed to be Little Sister feeding her newly rescued white tiger cub. When Tashi and Jack rescue Baba Yaga from a pinch, she promises to grant them the talents of musical geniuses so they can win the Warlord's Talent Quest. Throw a random piggy into the mix, and you have a botched spell, an oinking Jack and one operatic pig! 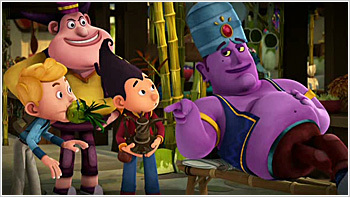 It's a little strange when the Warlord suddenly bestows onto Jack and Tashi the title of Kings for the Day. 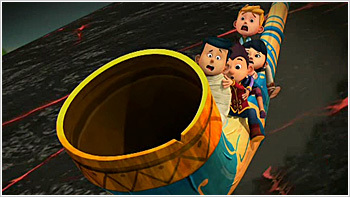 However, the boys quickly learn the evil Lord Fleamus from the next kingdom has apparently declared war on their village. 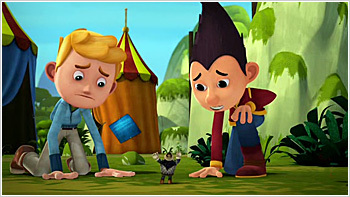 Jack and Tashi must go forth and confront his spider menace face-to-face! 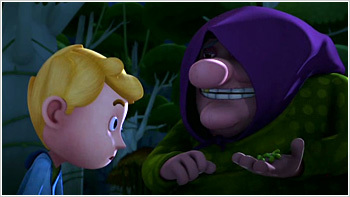 When a swarm of glugs comes to town, the only way to get rid of them is to call upon the Pied Bagpiper. 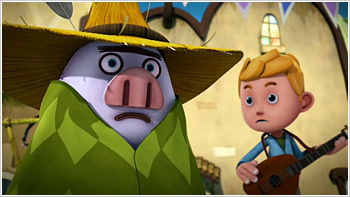 When the greedy Baron refuses to pay, the Bagpiper hypnotises the village and steals all their pigs. A wild Rumpus is set upon the village, and the only one who might help Tashi, Jack and Lotus is a sad genie who has been displaced from his lamp by a grumpy old Lightning Ghost. Tashi and Jack discover Wise-as-an-Owl's cave to be in a bit of a mess, so they summon a cleaning fairy from the Book of Tales. They forget to close the book and a fire-breathing monster jumps out and terrorises the village. 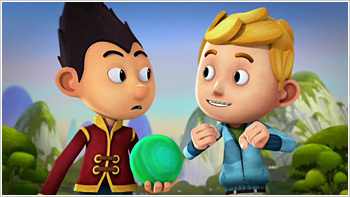 Tashi and Lotus show Jack how to find a Phoenix egg, but Tiki Pu steals it to present it at the Warlord's Banquet. When the egg unexpectedly hatches, the three kids must find a way to free the very angry, very fiery bird. 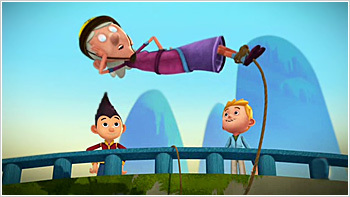 When luck finds Granny White Eyes, Jack and Tashi a fortune-telling fish, it's not so lucky that the Baron overhears it tell them that a great calamity will befall the village. When the fish escapes, the boys chase after it. All Tashi and Jack want to do at the village fair is to ride the Ghost Train. When the ride operator turns them away due to height restrictions, they jump on each other's shoulders and come back in disguise. 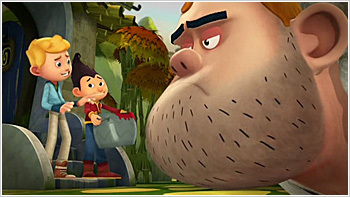 In order to dissuade some very rowdy Ogres from rampaging through the village, Tashi and Jack take some of Wise-as-an-Owl's embiggening potion to scare them off. It works, but then there's the problem of returning back to normal! 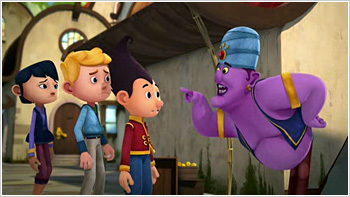 When Little Sister stumbles across a Genie's lamp on Gifting Day, she wishes that everyone in the village will get the gift they want most in the world. Unfortunately the spell doesn't go quite right and people start turning into strange creatures. 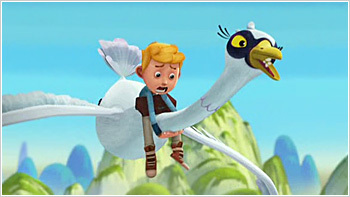 Tashi recalls Jack's arrival from the lowlands to the village... As Tashi and the village prepare for cousin Jack's arrival, little do they know that Jack is also bringing with him an angry Swan and even angrier Dragons!